Nevola Cotts went to be with her Lord and Savior on January 14, 2015, under the care of HopeWest, Grand Junction. Nevola was born in Stillwater, Oklahoma, to Ralph Elbert and Norma Giddens Hart. She married Samuel Bert Cotts on September 6, 1953. They had one son, Leroy Eugene Cotts, who passed away in August, 2013. Nevola worked many years as a housekeeping manager for Howard Johnson and Bar X Hotels. She also worked several years at Palisade Pride Fruits. Nevola enjoyed her garden, collecting humming birds, and vacationing with her sister's family. She was loved and respected by all who knew her and will always be remembered for her fun-loving and spunky spirit. 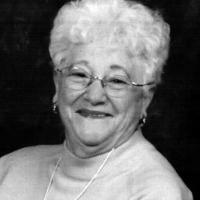 In addition to her son, Leroy, Nevola was preceded in death by her husband, Bert; her mother and father, Ralph and Norma Hart; a nephew, Ralph Eldan Hart, and a niece, Brenda Kay Derby. She is survived by her sister, Clara Mae (Bob) Klein; brother, William Elbert (Mildred) Hart; daughter-in-law, Judy Cotts; grandson, Billy Eugene (Nicole) Cotts; great-grandsons, Taylor, Braydon, and Treyson Cotts; nieces, Shelia Klein, Teresa June Sweetland, Bonnie Jo Cox, Brenda Kay White, Twyla May Derby, Jacqueline Knight, Barbara Boyd, and Pat Wallace; nephews, Alan (Monique) Klein, and Paul Wayne; great-nephews, Bobby (Crystal) Klein, Nathan and Keegan Klein. Nevola was a member of A House For His Name Community Church, Kannah Creek, having attended there for several years before her illness. She was a close friend of Pastor Bobby and Carolyn Clement's family for 28 years and stayed with them for several weeks before going into HopeWest Care Center. She was passionate in sharing her love for her Lord Jesus Christ. Memorial services are scheduled for 2:00 p.m. on Saturday, January 17, 2015, at Callahan-Edfast Mortuary, 2515 Patterson Road, Grand Junction. Internment will be at the Orchard Mesa Cemetery. The family requests memorial donations may be made in Nevola's honor to HopeWest, 3090B, North 12th Avenue, Grand Junction, CO 81506.